SUPPLEMENT FEED FOR CATTLE ON PASTURE, MAINTENANCE OF HORSES, GROWER SHEEP AND GOATS. Feed to mature horses, cattle, sheep and goats consuming adequate quantities of forage. Do not feed free choice. Recommended feeding rates for each species: Horses: Feed at the rate of 0.5 to 1% of bodyweight. Cattle: Feed at the rate of 0.5 to 1.5% of bodyweight. Sheep and Goats: Feed at the rate of 1 to 2% of bodyweight. An appropriate mineral supplement suitable for each species should be fed along with this product. Monitor body condition of livestock on a regular basis. Recommended feeding rates should be adjusted depending on livestock body condition. When making a ration change, allow 7 to 10 days for animals to adjust to the new ration. Keep a constant supply of good quality hay or pasture available to animals at all times. Provide adequate feeder space for each animal. Feeders should be well protected and well managed to prevent feed from becoming wet and moldy. Provide mineral and salt free choice. Provide fresh, clean water near the feeding area. Processed Grain By-Products, Grain Products, Molasses Products, Roughage Products, Calcium Carbonate, Salt, Soybean Oil, Propionic Acid (a Preservative), Citric Acid, Phosphoric Acid, Vitamin A Supplement, Ferrous Sulfate, Potassium Iodide, Manganous Oxide, Cobalt Carbonate, Sodium Selenite, Sodium Molybdate, Zinc Sulfate, Manganese Sulfate, Zine Oxide. Store in a dry, well-ventilated area protected from rodents and insects. Do not feed moldy or insect-infested feed toanimals as it may cause illness, performance loss or death. 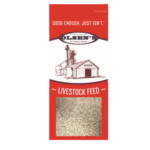 This product was made in a feed manufacturing facility that does not handle or store products containing animal proteins prohibited in ruminant feed.